Bricks and mortar, cement and concrete, and from foundation to chimney – AAP Construction has been doing all these things and more since 1993 That's because we are masonry all-rounders. A mason service must perforce have competencies in many aspects of building and maintenance to be 'best in class'. 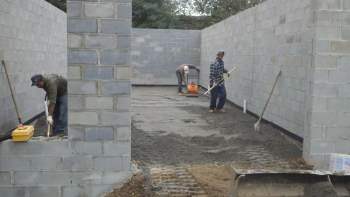 This is a given for AAP Construction for the straightforward reason that we provide all kinds of mason-related services. Even though many masonry products are pre-cut by the manufacturer, when necessary we use our own tile-cutting saws and wet saws. We use lines and levels to ensure vertical and horizontal lines. And, of course, we use the good old trowel, the mason's be-all, end-all. Interested in a quick 'Masonry 101' session? Phone us at (973) 298-1013! We'll be happy to pay a no-obligation visit. We are proven experts in all things Masonry; after all, we have been in business since 1993. During this time we have done mason-work from some simple cementing and concrete projects to designing pretty fireplaces to laying critical foundations. This does not mean only making and building, it also means mending and repairing. As a down-to-earth company, AAP Construction has no pretenses. We're here to tackle any masonry job, big or small, simple or difficult. Please click on our other mason-related services on this website. The range and width of our services will leave you impressed. And if you want to learn more about our skills and prices, just phone us at (973) 298-1013 and a friendly and professional AAP Construction rep will be glad to pay you a no-pressure visit!